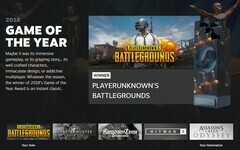 Thanks to the votes of The Steam Community members, PUBG is now holding the Game of the Year Award for 2018. However, CD PROJEKT RED, the Polish company behind the successful Witcher franchise, was crowned as The Best Developer. PUBG competed for this prize against Monster Hunter World, Kingdom Come: Deliverance, Hitman 2, and Assassin's Creed: Odyssey. Last year was an excellent one for gamers everywhere, although it came with a few major disappointments as well, Fallout 76 being the greatest blunder that comes to mind. 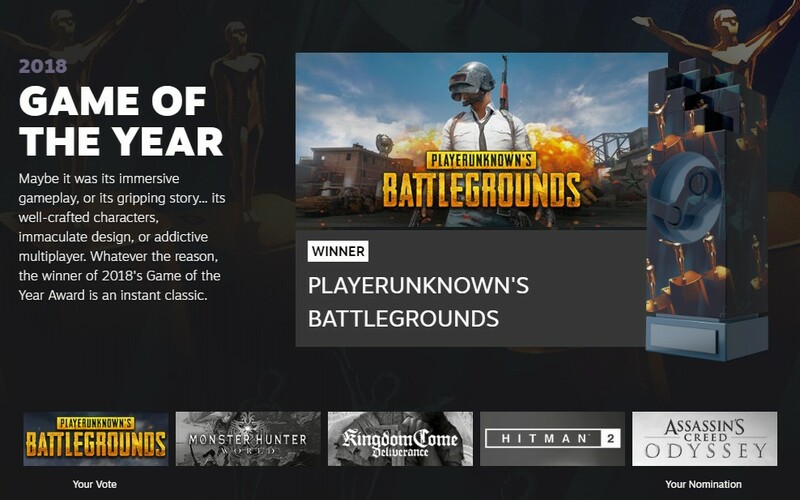 Since Fortnite is not available on Steam and so it was not one of the candidates, becoming the Game of the Year was quite an easy task for PUBG, although it had to compete against a few strong titles, such as Assassin's Creed: Odyssey and Hitman 2. The greatest — and sometimes, unexpected — losers were Fallout 4 VR in the second category, Dota 2 (Labor of Love), Ubisoft and Rockstar (Best Developer), Shadow of the Tomb Raider and Far Cry 5 (Best Environment), CS:GO (Best With Friends), Hears of Iron IV, Fallout 4, and Civilization VI (Best Alternate History). What do you think about the choices of The Steam Community? Would you have chosen differently? Let us know about the best titles you enjoyed last year in the comments section.